Human behavior is contextualized and understanding the scene of an action is crucial for giving proper semantics to behavior. In this chapter we present a novel approach for scene understanding. The emphasis of this work is on the particular case of Human Event Understanding. We introduce a new taxonomy to organize the different semantic levels of the Human Event Understanding framework proposed. 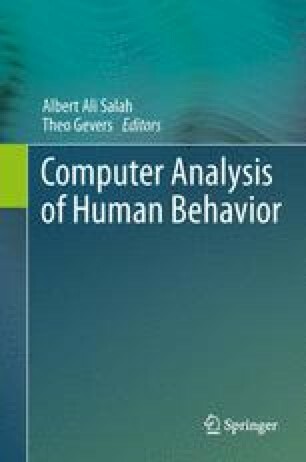 Such a framework particularly contributes to the scene understanding domain by (i) extracting behavioral patterns from the integrative analysis of spatial, temporal, and contextual evidence and (ii) integrative analysis of bottom-up and top-down approaches in Human Event Understanding. We will explore how the information about interactions between humans and their environment influences the performance of activity recognition, and how this can be extrapolated to the temporal domain in order to extract higher inferences from human events observed in sequences of images. We gratefully acknowledge Marco Pedersoli in providing the detection module. This work was initially supported by the EU Project FP6 HERMES IST-027110 and VIDI-Video IST-045547. Also, the authors acknowledge the support of the Spanish Research Programs Consolider-Ingenio 2010: MIPRCV (CSD200700018); Avanza I+D ViCoMo (TSI-020400-2009-133); CENIT-IMAGENIO 2010 SEGUR@; along with the Spanish projects TIN2009-14501-C02-01 and TIN2009-14501-C02-02.